Dublin, Ireland – March 2nd, 2015. StoryToys, a leading publisher of interactive books and games for children, has been awarded the prestigious BolognaRagazzi Digital Award 2015 for ‘My Very Hungry Caterpillar’, an app for children based on the work of renowned illustrator and author Eric Carle. In My Very Hungry Caterpillar the much-loved Very Hungry Caterpillar character appears for the very first time in fully interactive 3D form. 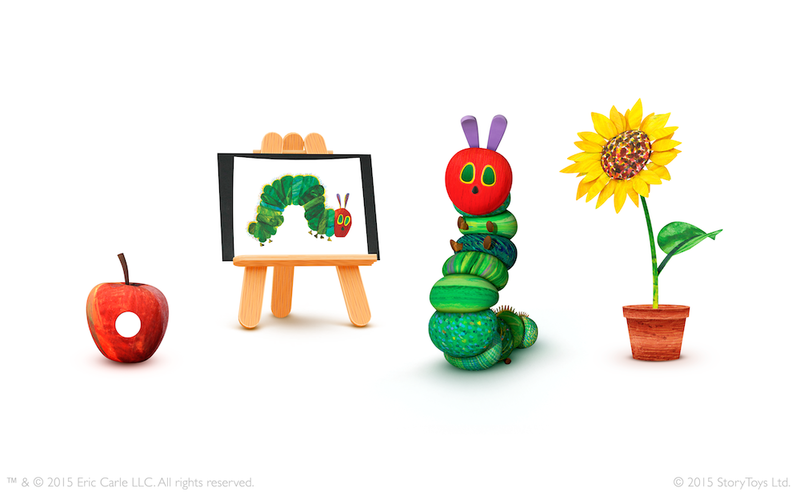 Children can nurture, feed, care for, and play with their very own caterpillar in a beautiful 3D environment based on the classic illustrations of Eric Carle. The app delivers a wonderful new experience for the millions of fans of this classic book, first published 45 years ago, and has topped app charts in 30 countries around the world, including the UK, Germany, Japan, France and Italy. “Everyone in StoryToys is incredibly proud and grateful to have received this recognition from the Bologna Ragazzi jury” said Emmet O’Neill, Chief Product Officer of StoryToys. “Our team did an amazing job building this wonderful app, supported at every step by our partners from The World of Eric Carle and the Joester Loria Group. We always believed that we had created something special with My Very Hungry Caterpillar. We wanted to create an immersive, personal experience that helped children to connect with Eric Carle’s iconic character in a new way. It is very gratifying to have our work recognised by such a renowned organisation as the Bologna Children’s Book Fair. Headquartered in Dublin, Ireland, StoryToys creates and publishes highly innovative and entertaining software for children including interactive books and games. StoryToys is a registered trademark and trading name of StoryToys Entertainment Ltd. Apple, iPad, iPhone and iPod touch are trademarks of Apple Inc.,registered in the U.S. and other countries. Google Play and Android are trademarks of Google Inc.